10-15 knot winds off Fort Adams enabled the race organizers to pile in a full day of competition at the World Match Racing Tour Newport, to conclude the Super 16 Knockout round. 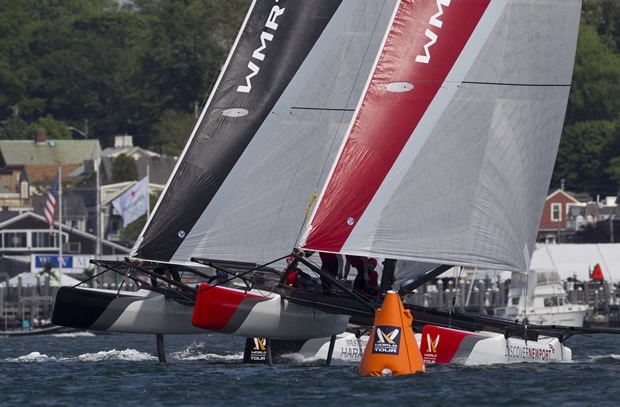 The gusty conditions on Newport Harbour once again made for nail-biting racing with much hull flying and lead changes. A few of these series went 3-0: Dackhammar and his ESSIQ Racing Team winning the Swedish derby against Johnie Berntson’s FLUX Team; Ian Williams’ GAC Pindar taking out Matt Jerwood; Nicolai Sehested’s Trefor Match Racing beating Eric Monnin; Yann Guichard’s Spindrift racing coming out on top against Swedish Olympic silver medallist Hans Wallén; and Swede Stefan Rahm conquering Sally Barlow’s Team Magenta 32. But these definitive scorelines mostly didn’t reflect the closeness of the racing and the numerous spectacular moments that stirred the crowds gathered along the shoreline of Newport’s historic Fort Adams. Team Magenta 32’s U.S. helmswoman, Sally Barkow, seemed personally deflated after her matches against Sweden’s Stefan Rahm: “I think the boat was going well and we were sailing okay in the boat, but I was making some bad decisions. You could tell we were doing well, because we were gaining, but around the course, we were being too risky. Some matches went to the wire including the U.S. derby where Taylor Canfield and his US One Team eventually overcame Californian sailor Michael Menninger and his 13 FIFTY crew. The ‘Aussie-Kiwi’ dust-up that concluded the day between David Gilmour and Phil Robertson saw some of the most aggressive and high speed racing. But after Gilmour won the opening match, Robertson claimed the next three. The winner of each pair moves on to the Quarter Finals tomorrow.